Born: July 23, 2016 Height: 9-7/8"
Bono is the pick puppy from our stunning Rock Star Litter, which also included Adele, Fiona, Madonna, Stevie and Mick. With outstanding conformation, movement and presence, Bono quickly finished his AKC Championship. 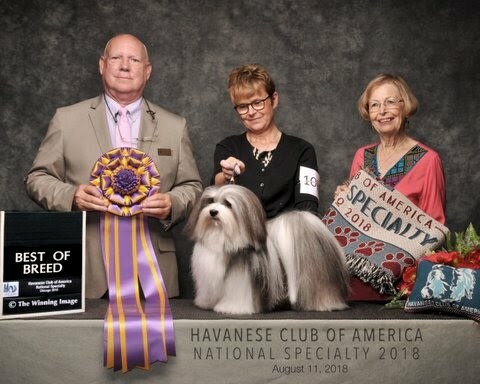 Bono's next appearance was the Havanese Club of America National Championship in September 2017, where at 14 months of age, Bono was awarded Best in Sweepstakes by Judge Terry Farley. In 2018, Bono started his specials career with a bang, immediately becoming, then remaining, No. 1 Havanese in Breed and All-Breed Points, All Systems. He finished 2018 as Top Four Toy, All Systems, with 9 Bests in Show, 8 Reserves Bests in Show, 7 Bests in Specialty Show, 51 Group 1 awards, 23 Group 2 awards,17 Group 3 awards, 8 Group 4 awards, and a total of 24577 dogs defeated. For details, see the link to Bono's 2018 show record in the sidebar above. Forty-one (41) Group One awards in 2019 through April 14, 2019.